With the help of her mom Jaclyn Jose, Andi Eigenmann remains optimistic about being a single parent. 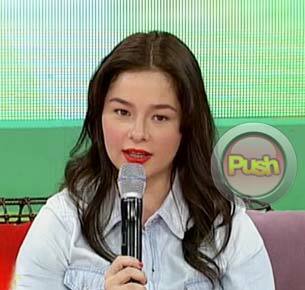 As a single mom, Andi Eigenmann has learned to take on the responsibility of having a baby. In fact, she made it a point to pay for her doctor and hospital bills when she gave birth to baby Elli (Adrianna Gabrielli). “Yes, since nagwo-work na ako, I have my own money already. When I got pregnant, with everything that I needed to pay for, siyempre ako na yun. If I can pay for it, I did. And at times na parang wala akong pera, my mom would help me naman,” said Andi in an interview together with her mom Jaclyn Jose on Kris TV’s January 25 episode. Apparently, it was Jaclyn who wanted her to fully experience what it means to be a parent. “Ang sa akin, pampa-boost din yun sa kanya. Talagang at a certain period of time, sabi ko sa kanya, ‘You have to save this for your panganganak.’ Kasi iba yung naibibigay sa ’yo kapag ikaw mismo yung buong nagbayad. Siyempre as a mommy, alam ko what she’s going to feel,” the veteran actress added.